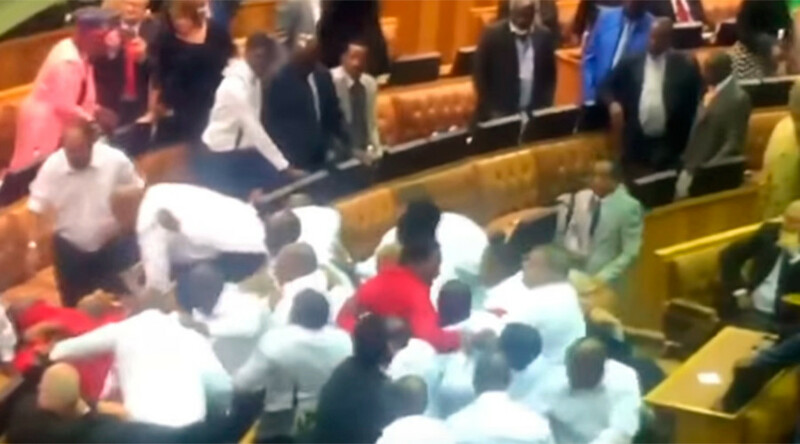 A mass brawl broke out between guards and opposition lawmakers in the South African parliament on Thursday after the opposition sought to stop President Jacob Zuma from taking the floor, hurling a storm of insults at him. The latter insult, thrown by EFF leader Julius Malema, prompted violent scenes of eviction, ordered by Parliament Speaker Baleka Mbete. As can be seen on the video uploaded by RT’s video agency Ruptly, the disgruntled MPs, vastly outnumbered by security staff in black and white uniforms, were rounded up and ejected from the premises. In one of the most dramatic moments, the guards encircled an EFF lawmaker and literally turned him upside down in an attempt to drag him out by his feet. Prior to the fracas, EFF MPs were trying to thwart the scheduled State of the Nation address by Zuma, bombarding him with questions for over an hour. In the run-up to the speech, during which Zuma unveiled a number of landmark proposals he claimed would economically empower the black population, security outside the parliament was beefed up with some extra 400 soldiers. The eviction of the EFF lawmakers spurred protests among MPs standing in opposition to Zuma’s African National Congress (ANC). The members of the liberal Democratic Alliance (DA) party walked out of the session shortly after accusing Zuma of violating the law with unprecedented military reinforcements at the parliament. "The ANC under Jacob Zuma has broken parliament and the constitution," DA leader Mmusi Maimane claimed in a statement, vowing to take a legal action against Zuma, as cited by Reuters. While no other major incidents were reported during the address, police patrolling the streets near the Parliament deployed stun grenades to break up a confrontation between Zuma supporters and rival EEF activists who gathered a few blocks away from the building. 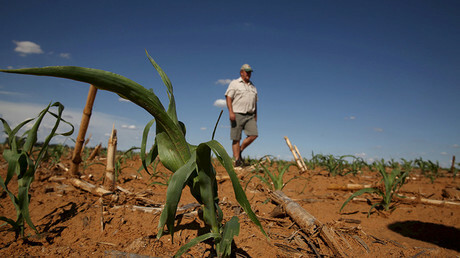 The South African government has been mired in corruption scandals, with President Zuma being accused of misusing public funds to decorate his private property. In September 2016, Zuma was ordered by a court to repay 7.8 million rand ($502,492) to the state budget.